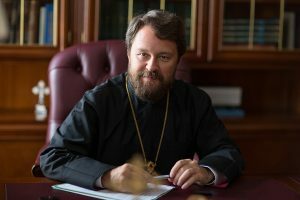 On April 16, 2013, with the blessing of His Holiness Patriarch Kirill of Moscow and All Russia, Metropolitan Hilarion of Volokolamsk, head of the Moscow Patriarchate’s department for external church relations, visited Poland. 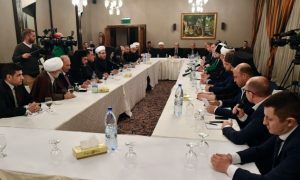 He was accompanied by Hegumen Philaret (Bulekov), DECR vice-chairman, Archpriest Igor Yakimchuk, DECR secretary for inter-Orthodox relations, Hierodeacon Ioann (Kopekin) assistant to the DECR chairman, A. Churyakov, a staff member of the DECR, and Orthodox laymen I. Savvidi and A. Sevastyanov. In a solemn ceremony at the Orthodox Cultural and Religious Center in Warsaw, Metropolitan Hilarion presented the Polish Orthodox Church with an iconostasis for the Center’s Chapel of Ss Cyril and Methodius Equal-to-the-Apostles as a gift from His Holiness Patriarch Kirill. Welcoming the guests, the Primate of the Polish Orthodox Church, Metropolitan Sava of Warsaw and All Poland, expressed cordial gratitude to Patriarch Kirill for the precious gift as a visible testimony to fraternal love which had tied the two Church from old times. He also thanked Mr. I. Savvidi for his support in financing the iconographic work and awarded him the Order of St. Mary Magdalene Equal-to-the-Apostles, the highest award of the Polish Orthodox Church. Addressing Metropolitan Sava, the DECR chairman conveyed him a greeting and best wishes from Patriarch Kirill and congratulated him on his 75th birthday. Then the head of the Polish Orthodox Church gave a dinner. 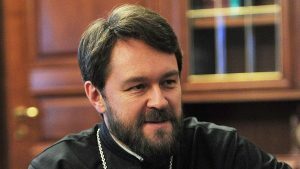 Among the guests were Metropolitan Hilarion and his party, Archbishop Jeremiah of Wroclaw and Szczecin, Bishop George of Siemiatycze, and Russian Ambassador to Poland A. Alexeyev and his wife. Later that day, Metropolitan Hilarion and Metropolitan Sava had a talk. 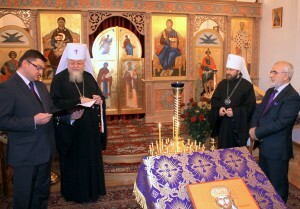 They discussed various matters concerning cooperation between the Russian and Polish Orthodox Churches.